Nanjing is not as cold as before. It’s a time to get out from hibernation. Nanjing scribble is active now. How are you all? When I returned from the winter holiday, I noticed many new changes here. First, there now is a branch of Bank of China open at the subway station building, next, some new shops around here, too. How fast the city, or should I say China, is changing! I mentioned it before, they don’t rest even at night. I was also amazed by the number of people. Being away from China for a few weeks really made me feel overwhelmed when I came back and saw Nanjing again. There are people everywhere－day and night. When I was away from Nanjng in this winter break, where I was? Good question. First of all, I visited Thailand and went diving. It was a good season in Andaman Sea and the Similan and Surin islands were well known for some of the best diving in the world. So, I flew to Phuket and got on the MV Colona VI for 4day/4nights cruise. There are nine granite islands in Similan but some of them are closed for conservation but still you can enjoy many great places to see coral gardens, a variety of fish and many sea animals. 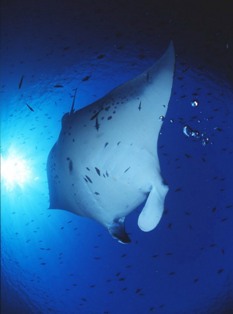 In Sirin there are the famous Richelieu Rock, Koh Bon and Koh Tachai which all are great dives especially for Manta Ray. Under the water, it’s just beautiful there. God has a great artistic talent to create nature. I am always stunned by its beauty. Every dive was amazing but one of our high lights was the dive in Koh Bon and seeing Mantas for the entire time. Here is a photo from Claudio who is one of the owners of this boat.